Since a few days, we’ve been experiencing a very slow WiFi signal in the house, even when we’re within 1 meter distance of the Time Capsule, the different speedtests won’t go above 10Mbit (on both 5Ghz and 2.4Ghz, the latter was even worse with max 4Mbit). Obviously, my first suspect was the actual Internet speed, so I put a cable in the Time Capsule and I got a nice 186Mbit average (on a 200Mbit connection, which is not too bad). So, the ISP is ruled out. There you can also go to the “Wireless Diagnostics” which has some nice features. As soon as the window opens, choose “Window” from the top menu and there you’ll find some interesting things. Especially the “Scan” (CMD-4) is a informative one. This will show all other networks and on which channel they are connected. Also, OS-X gives us (probably) the best channel to be used. From my scan, I could see 7 networks (including my own) in total, 6 on the 2.4Ghz and 1 on the 5Ghz. The 2.4Ghz was currently on Channel 1 and the 5Ghz on Channel 40. Both having a massive slowdown. 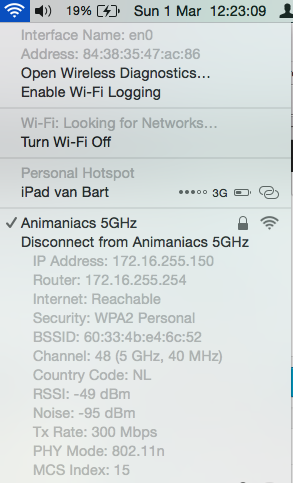 OSX advices me to use channel 2 or 6 for 2.4Ghz and 40 for the 5Ghz. I entered my configuration tool and set the 2.4Ghz channel to 6 and that one was kinda back to acceptable speeds (not groundbreaking, but I only have 1 computer connected to this band anyway). Still, the 5Ghz was still slow as hell while it was connected with a 300Mbit speed. Then I downloaded the iStumbler tool (Freeware, only asks you regularly to register). This gave me some insight. But first we need to know more about WiFi. WiFi is ‘just’ a radio signal so it has background-noise. Could be anything, from refrigerators to microwaves. As long as something is ‘leaking’ noise on the same channel as the WiFi, it could affect the quality of the line. I could see that my 5Ghz network had a signal strength of -49dBm and noise of -95dBm. For most Wi-Fi networks, you will see the signal measurement be between around -10 and -70 dBm, and should see the noise between -80 to -100 dBm. In these, the more negative the number is, the smaller its signal is. So, my line was pretty reasonable I’d say? But, I wouldn’t be me if I didn’t try to get it better, so I did. I changed my 5Ghz channel from 40 to 48 and my noise dropped to 0 (zero) dBm! Apparantly, the -95dBm noise was just about enough to interfere with the quality of my connection. Tagged apple, istumbler, osx, slow internet, slow wifi, time capsule, wifi. Bookmark the permalink.